When in under two weeks The New York Times runs not just one but two stories on a food phenomenon popping up around the country it's clear there's a trend cooking (from scratch) in kitchens across the country. The food swap is making a comeback. As Debbie Koenig notes in her Times story on an edible exchange in Brooklyn, there's nothing new about trading, say, currant scones for pickled beets. In the days when doctors made house calls, they sometimes received produce in lieu of payment for services rendered. 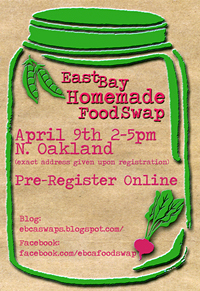 On Saturday afternoon at the East Bay Homemade Food Swap 25 mostly female home cooks who hadn't bartered before descended on Kendra Poma's cozy Oakland bungalow and set up a small space showcasing their wares in anticipation of the silent-auction style swap. Poma, a seasoned clothes swapper who was inspired to hold her own edible exchange after watching a video on a Portland food swap, plans to hold seasonal meet ups; the next event is slated for July. Future swaps will be held in local businesses, which can accommodate a few more swappers, though Poma says about 25 to 30 participants feels about right. "I like to be able to greet each person as they walk in the door," says the 27-year-old. For the first hour or so people milled about, chatting and checking out the chow. When Poma, who swapped peach-and-ginger kombucha, homegrown herbal teas and vegan boysenberry swirl chocolate cake, announced it was time to start making swaps, the room got really quiet as people focused on taking care of business, scribbling on the swap slips notes like "I'd like to trade my radish onion relish for a jar of your ginger pear butter." Once everyone had had a chance to make their swap choices known the actual trades took place. Informal, verbal requests for unclaimed items followed once written swaps had been honored. The idea, after all, is to go home with different foods. Surprisingly, a lot of participants polled on the day said they opted to make something new -- be that blood orange marmalade or their mom's kick-arse kim chee -- rather than play it safe with a tried-and-true recipe. 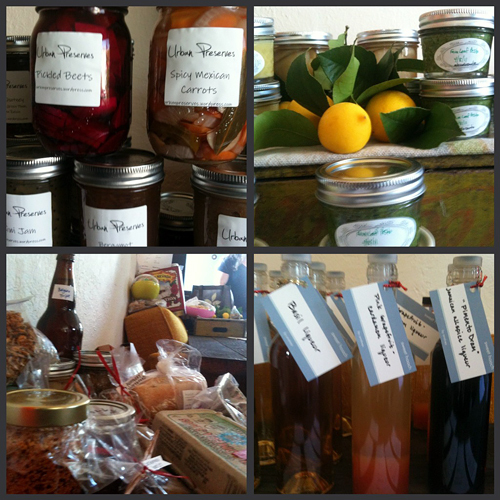 Some got ideas for what to bring next time: Drinking vinegars, in the case of Christina Stork, owner of the yarn store Article Pract, who makes fennel, orange, and pomegranate drops. Fueled by social media and a seemingly endless interest in urban homesteading, the edible exchange seems like a natural fit for local food fanciers. While a couple of participants on Saturday had sold goods via the Underground Market, they enjoyed the low-key, cash-free nature of the homey food swap. "It's a great place for me to trade excess inventory or offer a small batch of something, like my green gage plum jam," explains Becky Spencer of Urban Preserves. Since no money changes hands, such meet ups aren't subject to health department scrutiny, and nobody raised concerns about food safety at Saturday's gathering. Poma ran a smoothly choreographed event, part edible exchange and part social mixer, that went off without a hitch in just under two hours. She advises anyone interested in holding their own swap to visit the PDX Swappers Facebook page and The Hip Girl's Guide to Homemaking for pointers. 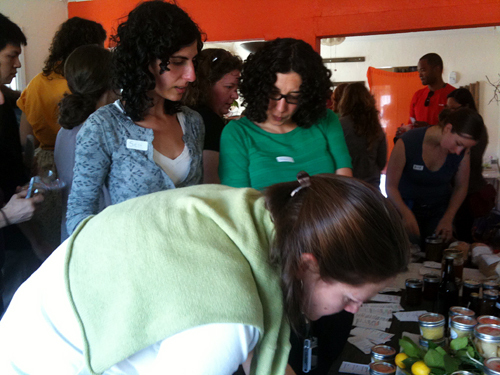 Other local swaps include canner Karen Solomon's monthly organic baby food exchange and Simran Singh and Stacie Dong's family dinner swap, both hosted by 18 Reasons in San Francisco and Forage Oakland's occasional produce and preserve exchanges. Coming soon: Belly to Belly Bartermart, hosted by local chef Ellen Johnson, according to Twilight Greenaway in her Times story on the Bay Area's food swap culture. "Whether it's Belgian beer, tomatillo sauce, or backyard eggs, you have a sense that someone has really nurtured whatever it is they're exchanging," she says. 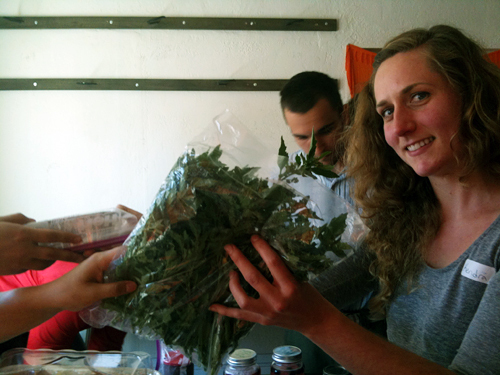 "Bartering in this kind of setting is a truly underground experience and a great way to network with like-minded people and create community without any money changing hands."